Diggers Valley: 28 February 2015. The week beginning the 28th of February 2015. 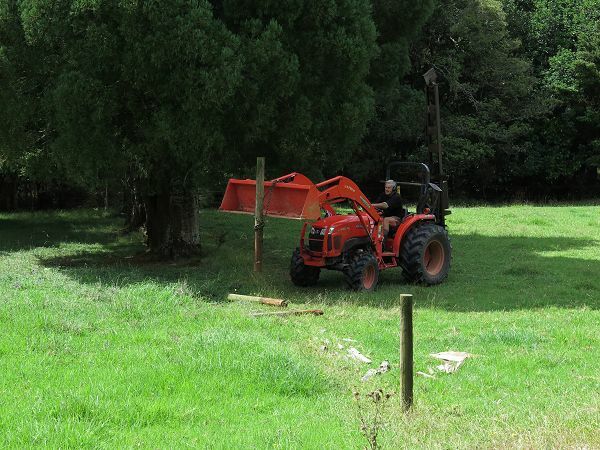 Having finished the Swamp Paddock fencing yesterday, today Stephan moved forward to the Frog and started clearing small trees out of the way of the planned stream-side fence line. 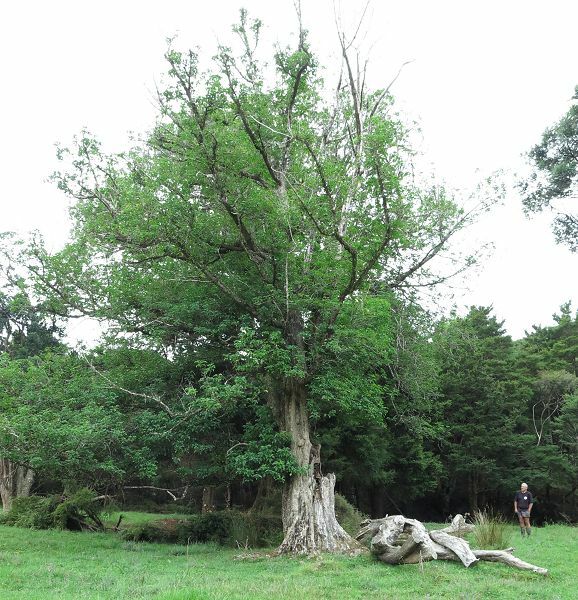 This very tall Puriri is an impressive tree and has been protected from some cattle damage in recent years by the growing presence of a few Totara trees around its base. 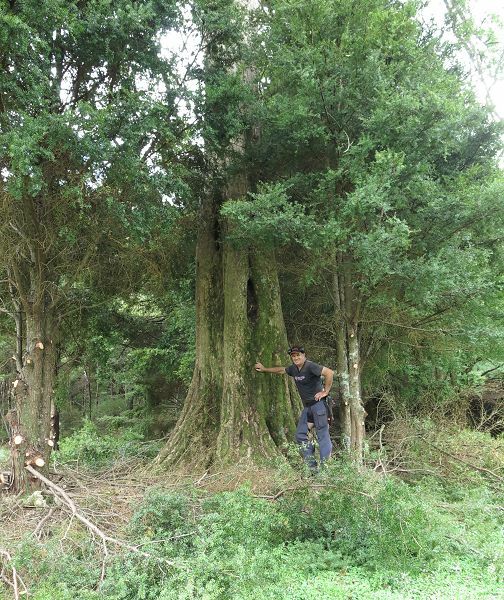 To enable us to plan where to put fencing around it to properly protect it, Stephan pruned the larger trees and cut out the smaller ones, exposing the magnificent trunk. 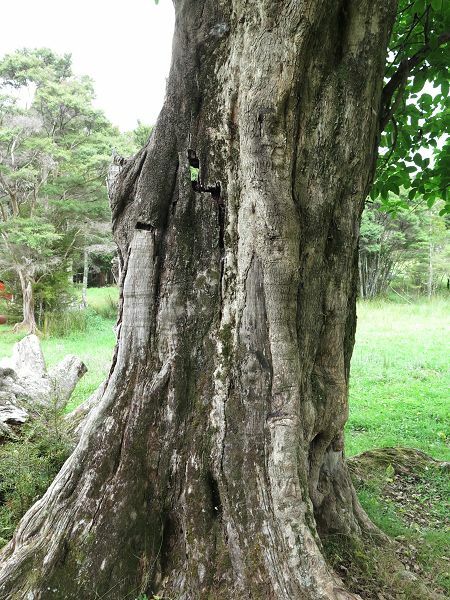 Puriri have a variety of forms, from this very tall, straight growth to the twin or triplet groups which form wide bases of great girth and the shorter, stouter trees whose branches grow much closer to the ground. I wonder whether we've seen less of these tall trees around because they were the ones most often cut down by the early farmers of this land for strainer posts? 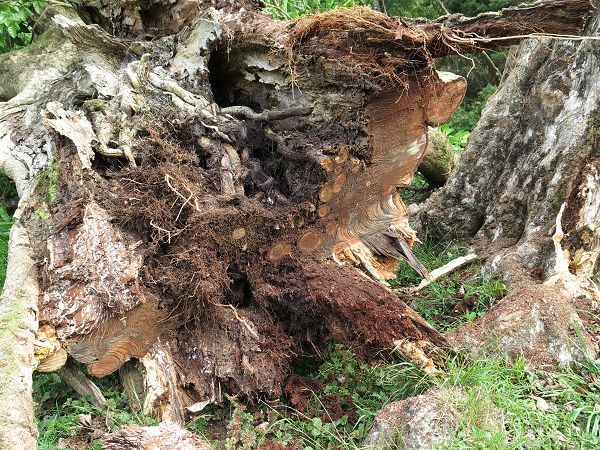 The tall tree's neighbour is this tree, which has lost two thirds of its bulk on two separate occasions, exposing the remaining trunk to water and rot. The opening cracks alarmed us, caused by the obvious lean of this still very heavy tree. 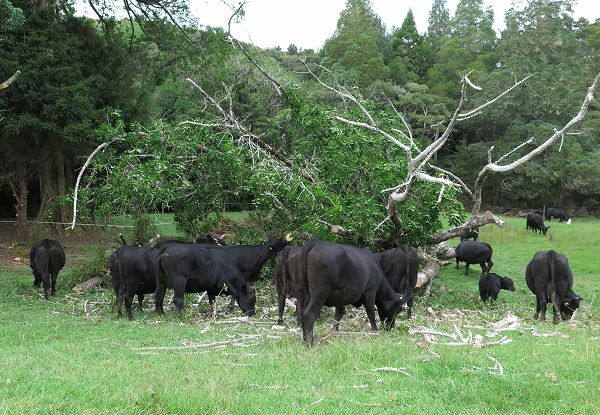 We discussed the possibilities for a while, contemplating the tree falling down unexpectedly when there are cattle nearby, along with the damage that would do to the fence which will be built around the trees. We decided it would be sensible to fell it. I don't like felling these trees, but when their collapse is inevitable, I'd rather do it in a controlled fashion. Last time we faced such a task, Stephan did it himself, carefully but with a few problems. This being a much bigger tree than that one, we decided to call in an expert with a big saw! 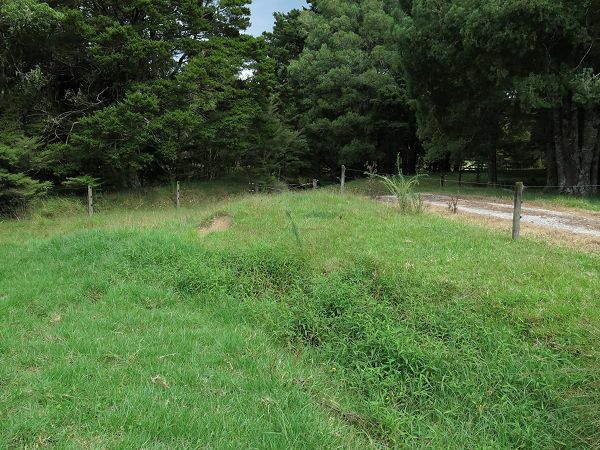 This is the front corner of the Frog Paddock on the same side of the stream. 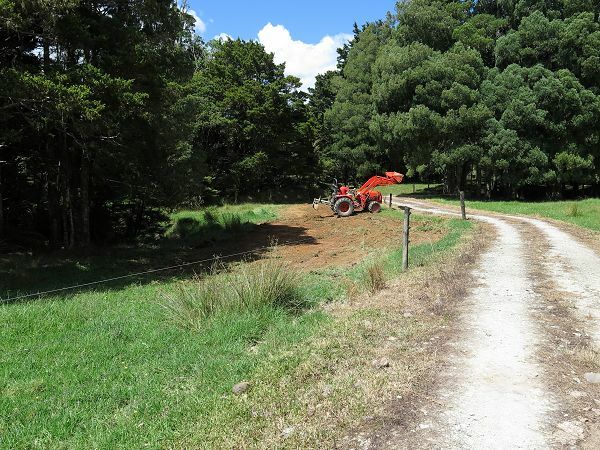 Stephan will do some earth moving here to fill in a low area which used to be a drain and will take out the fence posts along the lane; then we'll work out how to arrange the fencing. The stream is just to the left of the picture. 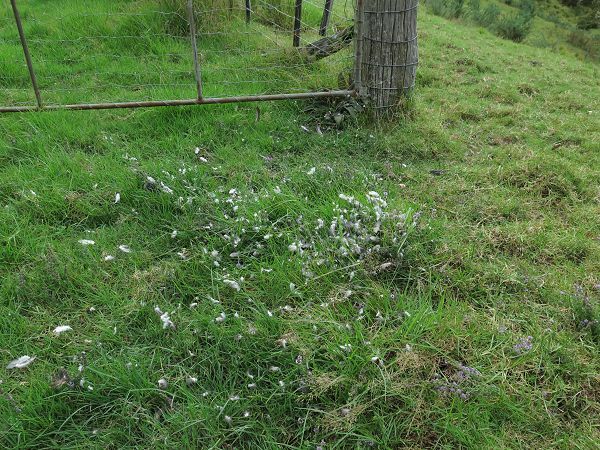 When I moved the cows and calves from the Middle Back to the Big Back North, I found all these feathers under the gate. 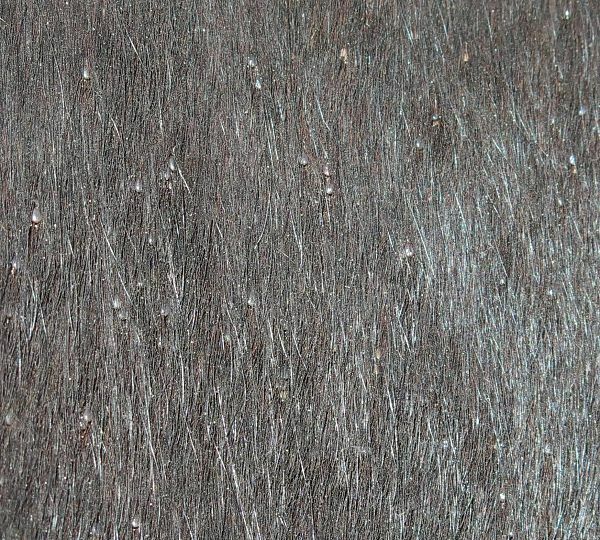 They're Kukupa (Kereru, native Wood Pigeon) feathers, from a dead bird. I wonder if it died of natural causes or was caught and killed by something else? There was no other part of the bird left. After I'd counted all the cows through the gateway and was closing it, a lot of characteristic Kukupa flight noise made me look up and I counted nine birds all flying together from out of the reserve area at the top of the adjacent PW. I haven't seen a big group like that for some time. The weather was perfect today, fine with enough breeze to be a really pleasant temperature. Autumn is a lovely time of year here. If I could moderate my gloomy anticipation of the approach of winter, I'd enjoy it much more. I haven't seen the cows and calves relaxing on this Big Back North slope before, just down from the main track up the hill. It was lovely in the shade here. Stephan, having a ball as usual. 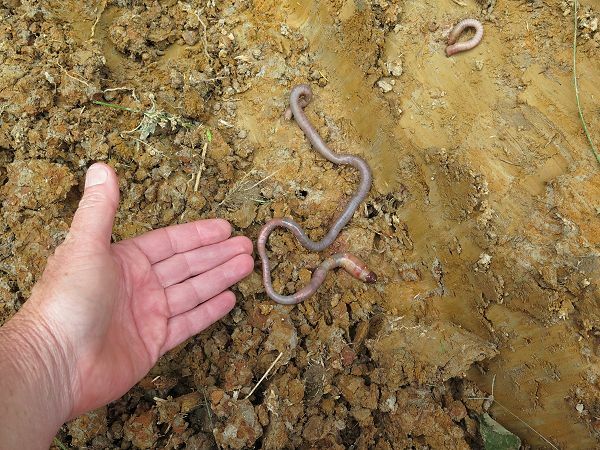 Native earthworms are quite big! Sadly quite a few of them get chopped when soil is being disturbed during farm development. 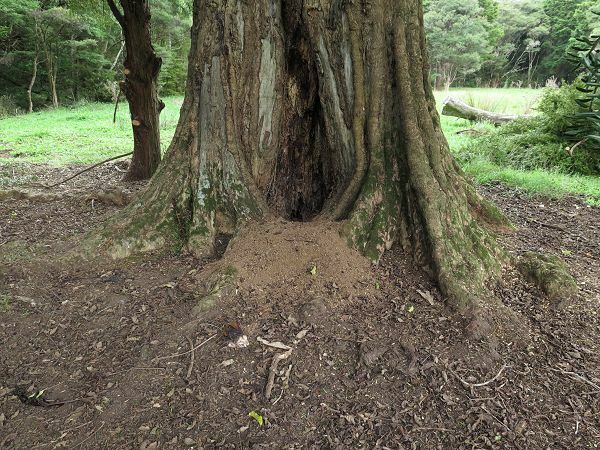 Some creature has been digging a hole at the base of the tall Puriri. 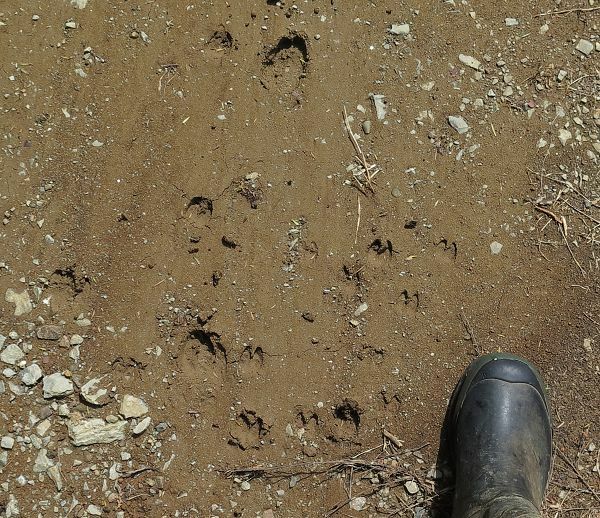 The soil was too loose to show any footprints, so we couldn't figure out what it might be. I've previously found bits of dead piglet and dead possums here, so either something drags its dinner in here, or sick things come here and die. 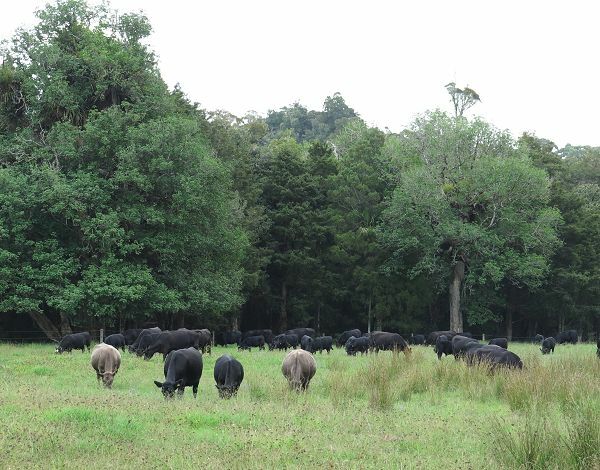 They're probably a bit boring, but I like pictures of the herd happily grazing in a new paddock. Especially with trees. One day I'll wipe those rushes. 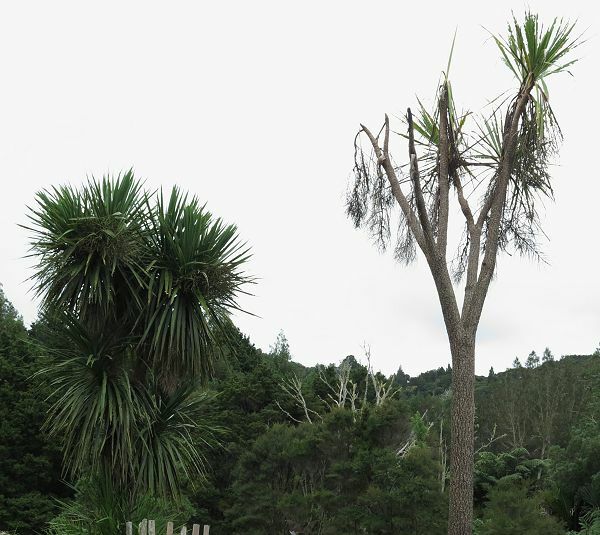 The dying/dead Cabbage tree with fewer leaves than two weeks ago. The ends of the bare branches are now going black. 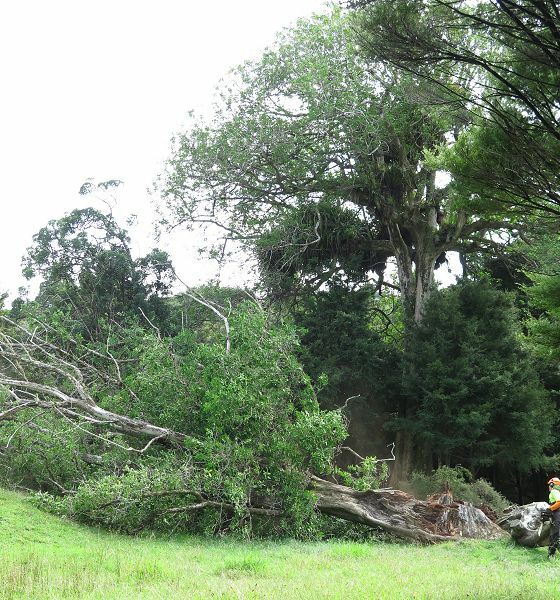 I rang Roger Gale last evening and asked if he'd have time to come and fell our unstable Puriri and he quickly rang back and said he could come this morning. A big saw makes a big difference to the ease and safety of such a task. The state of the trunk confirmed that we'd made a very good call: there was only the tiniest amount of original trunk still alive and holding the tree upright, with numerous smaller roots growing down through the trunk which kept parts of the tree alive, but probably didn't provide a lot of structural support. In the afternoon Stephan cut a lot of the branches and I took them away in several loads on the back of the ute to feed out to the cattle. I'll get the cows in to the paddock with the tree as soon as possible, but at the moment there's a big hole in the lane fence. 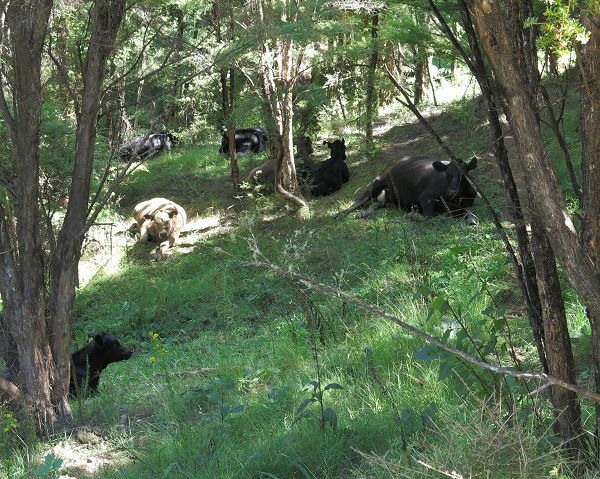 In the picture the heifers had come down from the Small Hill in to the lane and the cows and calves are still in the Bush Flat. Today, being so far behind in writing these weekly pages, I thought a daily photo might be fun and this was the first one I posted. Those slightly-larger photos and their page are still available for each day. What's the easiest way to present them? In the mean time I'll link from each photo so presented to it's daily photo page - just click on the picture. Let me know if another option would be better or easier. Zella and Imagen have been pushing their noses onto one of the gate latches over recent days to itch their nostrils, then snorting violently, expelling flying globs of snot. During milking, we've had to close the gate so Imagen can't do that anywhere near the milk bucket. I suggested we find something with a nicely shaped end, which could be screwed onto one of the rails and might be even more useful to them. We found this towel-rail bracket which Zella used with great pleasure. I really wanted one of those old coat hooks with the longer upper arm and a lower hook, because I think the long bit, with a rounded brass end would be just the thing to poke up your bovine nose. While Stephan milks Zella every morning, I heat up yesterday's milk for the calf and let him out of the little grassy area for his feed. (He gets yesterday's milk so I can skim its cream for our butter and ice-cream. No doubt he'd benefit more from the cream than we do, but seems to be growing alright.) Once Zella is finished, the other two calves come out for their breakfast too. Imagen's calf has continued being separated overnight because it's easiest that way and obviously does him no harm: he's the monster whose rear can be seen at the extreme right of the picture. Zella's calf doesn't get much breakfast if Stephan has done a good job, but feeds throughout the day and is also growing well. They get used to these weird feeding regimes. I'm still not sure about the geese. 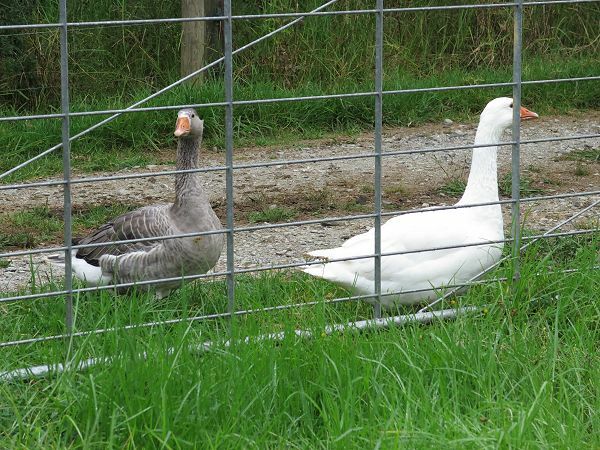 They behave inconveniently, turning up on the front deck and knocking on the windows early in the morning, honking at ear-splitting volume so that I've taken to wearing ear-muffs when I go out to feed them. I suspect they are just extremely glad to see me, but the noise is awful! 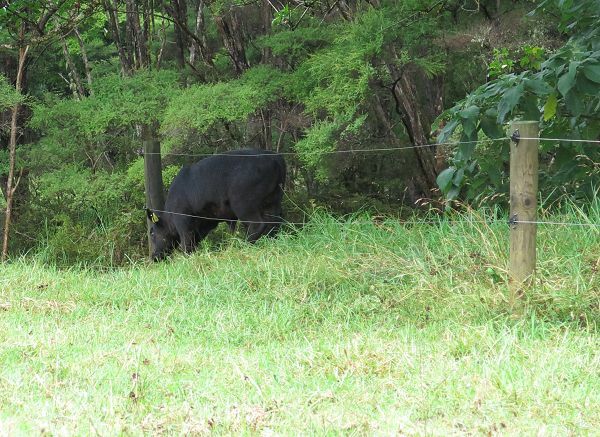 Emma 93's calf had gone through the non-electrified fence - at least I think it's still not hot - around one of the Puriri in the Bush Flat and I thought he'd follow the others when I moved them to the Big Back; but he seemed confused about how to get out again. Escaped and running to join the rest of the herd. We went up to the hospital for an appointment with an Ophthalmologist, who looked deeply into my eyes with a painfully bright light and assured me that the weird changes to my vision are merely a result of age-related infirmity. Very reassuring. I spent the rest of the afternoon looking like an owl, my pupils having been dilated for the examination. As we returned home up the valley, we were surrounded by fast-running water on the sides of the road and pelted with torrential rain! Fifty-nine millimetres fell in about two hours. 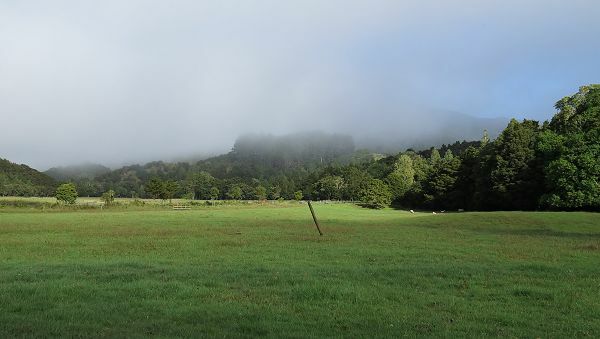 A steamy morning after yesterday's rain. I stopped to scratch Zella as she went out to graze this morning and noticed she has tiny ticks all over her neck. This must be quite stressful for her. I don't like using chemical treatments on our milking cow, but for the sake of her comfort I'll give this little group (Zella, Imagen and the three calves) the tick pour-on. 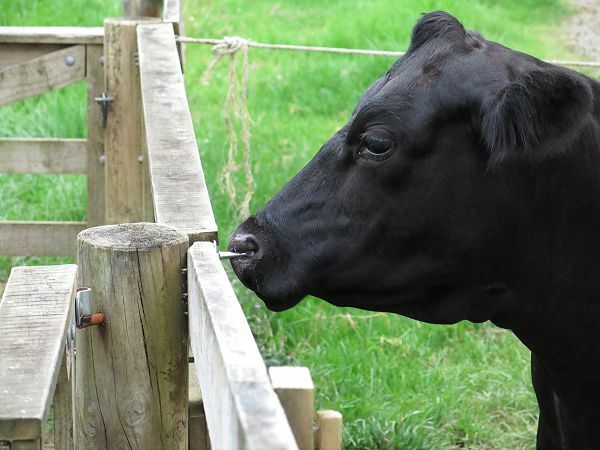 It has no withholding period after use for human consumption of meat or milk. 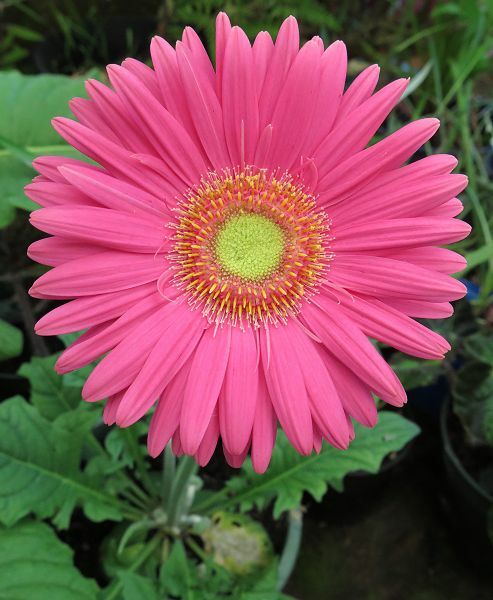 Here's my next Gerbera, grown from a bought packet of seeds last year. I love the colour intensity of these flowers, of such improbable hues. We had a site meeting and decided we'd widen this bit of the lane, rather than create a very narrow area in the paddock where the cattle might gather too closely when waiting to be moved. The bulge in the lane to the left hasn't caused too many problems and this will just widen it a bit more. 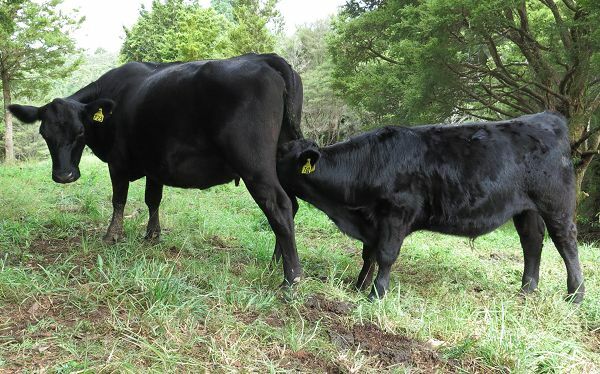 The two-year-old heifers are showing how hard they're working to rear their calves, but mostly doing an exceptional job. 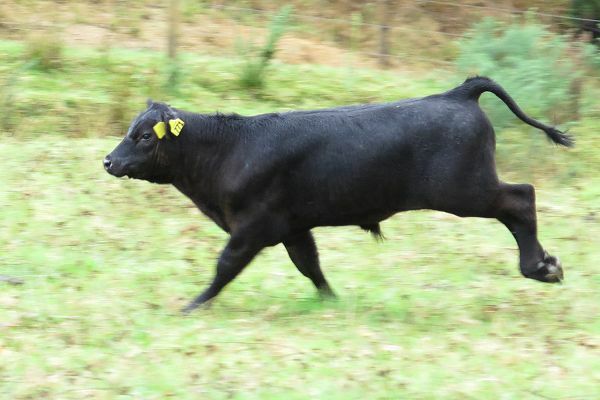 723 (shown here) and 716 are both quite thin, but their sons are looking really good. 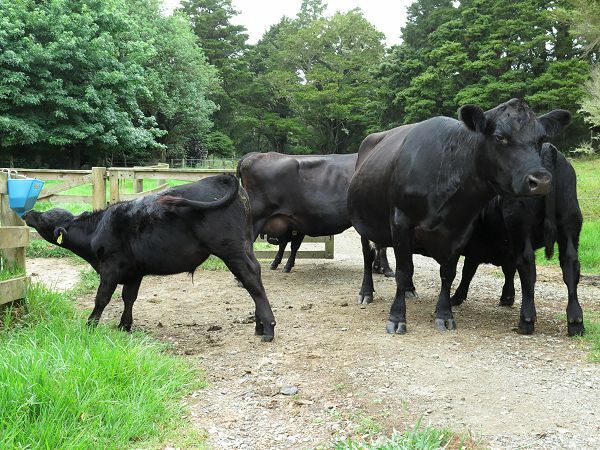 The calves are due for their vaccination booster shot, so I'll weigh them in the next few days. 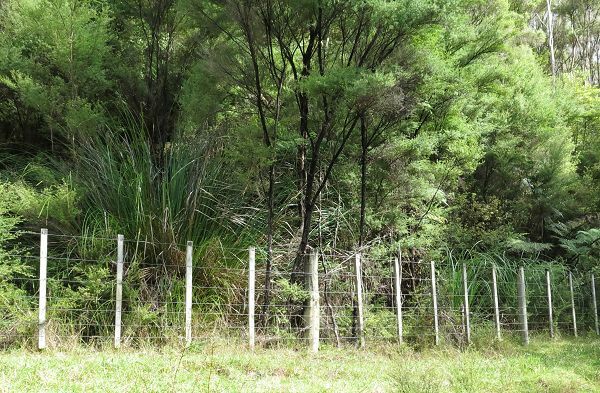 I took my Glyphosate weed-wiper to the other side of the stream in the Bush Flat Paddock and applied it to the rushes and sedge plants in the pasture, then wiped the Pampas plants on the other side of the Bush Hill Reserve fence. When I was a child, I understood Pampas was Toetoe, the native plant, but it was instead an invasive weed which grows freely around the region. Now I find it far easier to distinguish between the two. 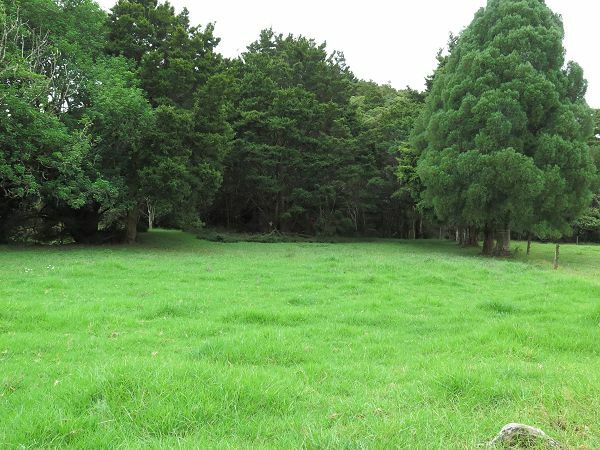 In this picture there is a large Toetoe on the left under the Kanuka trees and several smaller Pampas plants behind the fence along to the right. 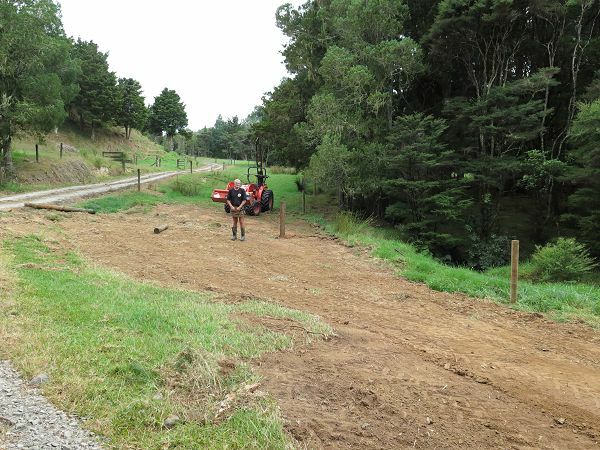 Stephan, in the mean time, finished the Frog Paddock and associated lane fencing and moved forward to this area which has always been part of the Frog Paddock, accessed through the huge trees and twice across the stream. 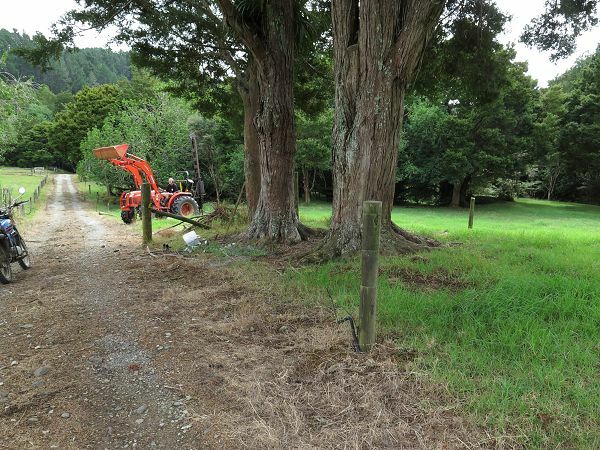 It makes much more sense for it to become part of the Windmill Paddock and so Stephan began pruning the large Totara trees where a new fence will go in to keep the cattle away from the river banks. Time for a bit of home maintenance, before we can't see the house because of the overgrown lawn! 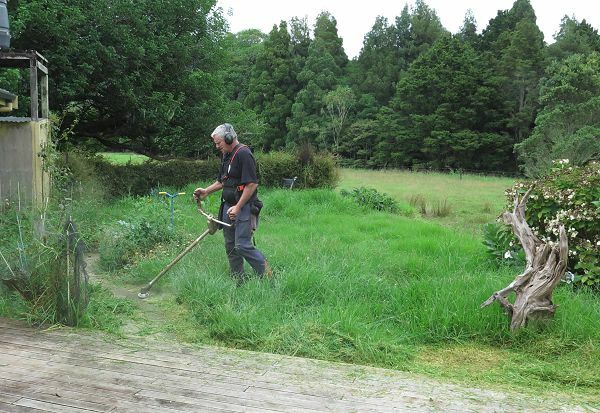 It has grown far too long for the ordinary mower. Then back to the fencing. 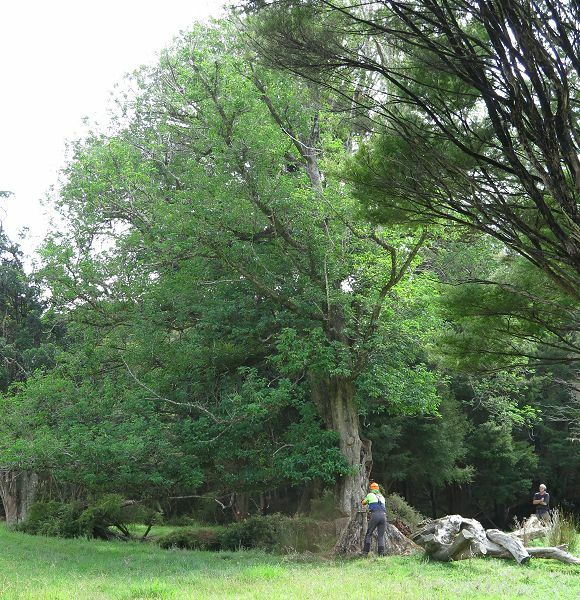 We decided that we'd alter the alignment of the fence where it passes these big Totara trees near the gateway. Previously they were in the corner of the Windmill Paddock, but that often meant animals got caught between them and the fence (those two posts still standing for the corner and the gate) by bigger bullies in the mob - not a huge problem, but distressing in the moment for the animals concerned. 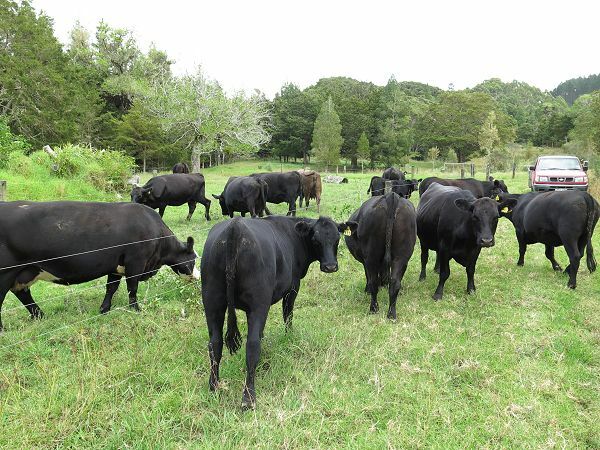 The new fence will be closer to the trees on this side and there will be an angled fence around the other side so the cattle no longer go around the trees at all. Then down to the right in the picture above, Stephan pulled out the old Windmill fence posts. 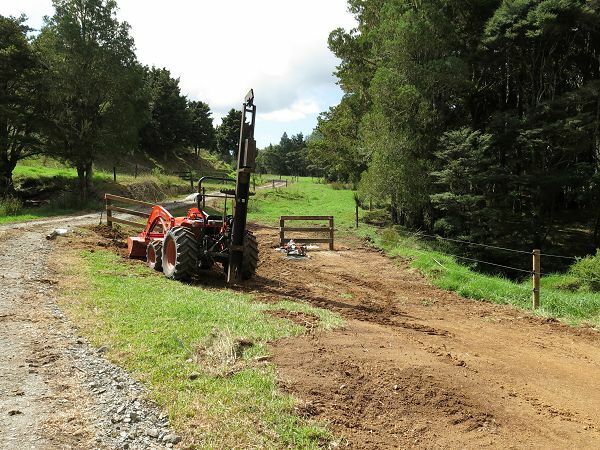 It's easy with the tractor - loop the chain around the post low down, hook it on the bucket and pull upwards. Sometimes they take a bit of jiggling, but nearly always come out pretty easily. This was one of the first tractor jobs I ever did on my own, back when we were clearing an old fence in preparation for fencing the Bush Hill block. I felt terribly powerful! These posts went in in 2004. 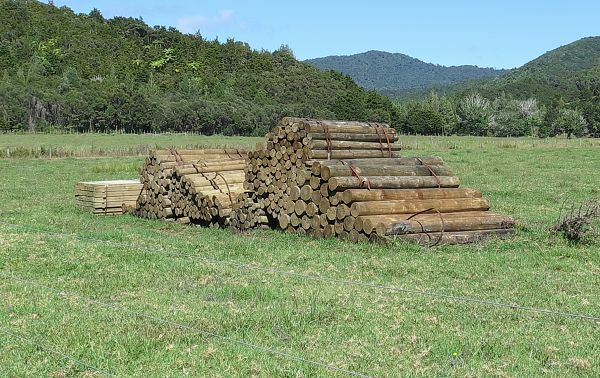 I took Stephan away again later in the day when I wanted to move the cattle in to the Frog Paddock to eat some more of the felled Puriri tree's foliage. There now being no stream access in that paddock, they needed a water trough. 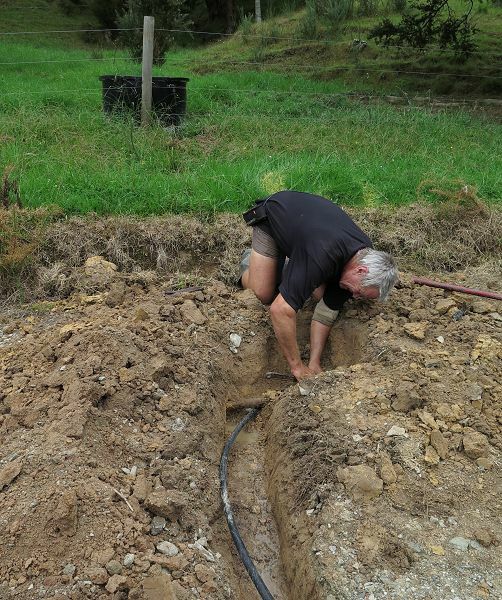 There's already a saddle (pictures here and here of previous saddle installations) taking a feed from the main pipe to the PW trough, so Stephan dug under the track until he found it and inserted a T-joint to feed the new trough on this side of the lane. Then we let them in. Most of them know Puriri is delicious, but obviously it's not to everyone's taste. Feral pigs are taking over the farm. We can't catch them, rarely see them to shoot them ... Damned things.